Saturdays November 5th, 19th and 26th,2016 from 9:30am - 12:30pm. Each Workshop costs $65.00 per person. 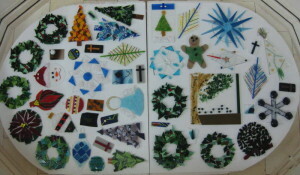 This includes all the glass, supplies and kiln firings to make 3 ornaments of your choice. No glass cutting experience necessary. Lots of designs to choose from. Register for the date you can come. Bring your friends — a fun way to get into the Christmas spirit and make a few gifts. Children 10 + welcome when accompanied by an adult. A kiln of ornaments waiting to be fired and snow people already fired. It’s time to make Christmas Gifts for those on your list! We had such a good time in November at the ornament workshops that we are offering another Christmas Ornament Workshop Saturday morning Dec 6th 2014 . Make 3 ornaments of your choice. 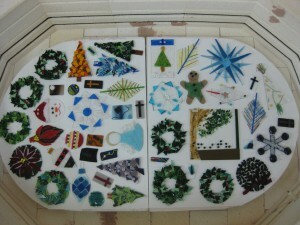 All glass, frit, stringers,nooodles, patterns and firings are included. If you have glass cutting tools(cutter, groziers, runners,ruler,marker, and safety glasses)bring them along. If you are not a glass cutter we will show you how and supply the tools for your time here. Register early as classes fill quickly. You do not have to have any glass cutting experience for this as we will be using crushed glass, stringers, noodles, and precut shapes for many of the decorating ideas. Come out – bring a friend or family member along and start your Christmas season off with some fun! Don’t celebrate Christmas? No problem! You can make several pendants or talk to Beth about some of your ideas. We are open to accommodating everyone. 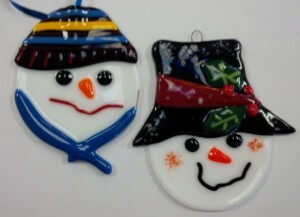 Well we had a lot of fun with so many of you who came out to our Christmas ornament workshops. 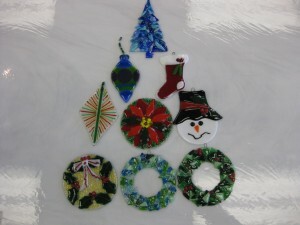 Many beautiful wreaths, poinsettias, Christmas trees,and holly circles were made. Snowmen and stockings were also favourite hangings to make. Look for these classes to run again next November and December.